For the March meeting of the Everyman Club the speaker was Peter Medhurst with a talk entitled 'Vivaldi in Venice '. Peter explored the amazing world of Vivaldi's music and brought it to life for those with musical knowledge and those with very little. He explained that Vivaldi is the one Baroque composer whose music is a direct reflection of the city in which it was composed. The reasons for this were many but Peter discussed three main ones. Vivaldi was a son of Venice and had an innate understanding of Venice's unique aesthetic including colour and emotion. Also Venice solved its problems with abandoned and orphaned children in an altruistic manner and the way in which that was done impacted on Vivaldi as a composer, teacher and musical director. Finally Vivaldi's health problems and his eccentricities as a man and a priest dictated his path as a musician and performer in Venice's cultural life. For the February meeting of the Club members enjoyed a talk by Dr. Jacqueline Campbell entitled 'The Royal Botanic Gardens, Kew'. Dr. Campbell has an Honorary Fellowship at Alexandria University in Egypt. Her work in the Pharmacy of Pharaonic Times earned her unrivalled access to Kew. She described the Origins of the Gardens through the development of its research and it was fascinating to hear of the history of the gardens and the collection of seeds and plants. Dr. Campbell's expertise was in the forensic collection of plant DNA which was, and is, vital for the preserving of the diverse species. Founded in 1759 this historic landscape garden includes work by renowned architects Bridgeman, Kent and Capability Brown, illustrating significant periods of design from the 18th to the 20th centuries. The gardens became a World Heritage Site in 2002. A happy new year. 2019 started with a interesting talk by Christine Robinson, former Housekeeper at Chatsworth House. Christine gave an interesting insight into the history and inhabitants of the House, along with the massive undertaking to keep the Hall and grounds in order. Christine and her husband still live within the park, there were some stories of how the Cavendish family entertain and look after their staff and keeping Christmas alive for all the children of the estate - Santa is seen on the roof, and then emerges from the chimney in the painted Hall. The Club’s November meeting turned out to be an enchanting one with our guest Kathy Lewis who charmed the audience within minutes of starting her talk. Kathy has had a musical career at very highest level. She won a talent competition when she was 12 years old and went on to work with top people in the business. She became a very versatile performer singing opera and ballads. Her musical career started with Semprini in Bridlington. She had a call to work with Max Jaffa and his orchestra in Scarborough. It was during a long summer season she got a call out of the blue from the entertainment director of P and O Cruises asking her to join their cruise ship Canberra on her world cruise. 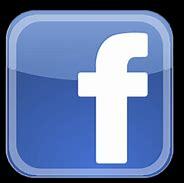 She subsequently did many more cruises meaning visited many parts of the world and met many eminent people. She had a long and happy career on ships despite lifelong seasickness. Finally, she went on to do musicals in The Theatre. Kathy’s talk gave a fascinating insight into this glamourous world. Everyone went home smiling. 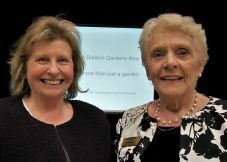 International Bomber Command was the subject of our October meeting. The evening opened with the appearance of a very special guest, RAF Veteran and Lancaster rear gunner James Flowers. 94 year old James described his first mission and also several others over enemy territory. He remembered every incident and detail and presented it in a style which made us feel we too were in the rear gunner’s position which as we know was very perilous indeed. Members warmed to his story telling and as it was his 94th birthday presented him with a card and members gave a rousing rendition of “happy birthday” at the end. Our guest, Barry Wallis then gave an excellent talk about Bomber Command and the sacrifices made. He specifically talked about the Bomber Command visitor centre at Lincoln, how it came about and gave details of the extensive exhibits that visitors can expect to see. 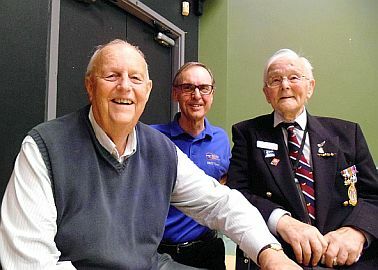 Barry spoke passionately about those who served in Bomber Command and the vital missions that were flown from airfields throughout Lincolnshire. He paid tribute the many thousands of aircrew who sadly did not return. A very informative and thought provoking evening much enjoyed by a good attendance. Well our first meeting of the new season certainly set a high standard. 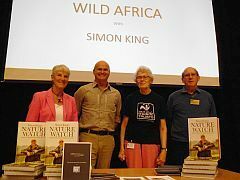 A full house of 300 or so were thoroughly entertained by our guest, naturalist Simon King as he gave an enthralling talk and photographic presentation of his experiences and knowledge of “Wild Africa”. Simon’s relaxed and amiable style together with his superb animal impressions captivated our audience. On this occasion the evening ran over time but not one person left early. 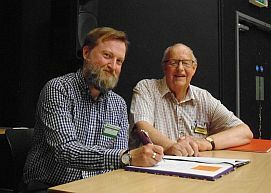 We were so grateful to our partners on this occasion, RSPB and The Lincolnshire Wildlife Trust, without whose help the meeting would not have been possible. 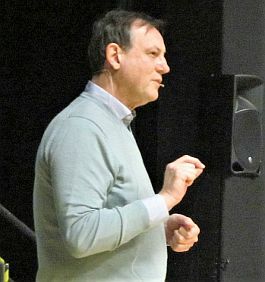 Our final meeting of the season took place on Tues 8th May, when our guest speaker was Andrew Lidster from The Nation Trust. Andrew took us through a family history story of The Massingberd family explaining how through some difficult times they managed to maintain Gunby Hall near Skegness. He explained how some of the people who inherited the estate came from the female line but when the married Massingberd was maintained as part of their name. As always with families some were more diligent on maintaining the estate than others who just wanted to take advantage of any money or privilege. The family included artists and musicians. In fact music seems to have been an important part of Gunby Hall history. As for the Hall itself, it replaced the former family medieval manor house which used to be at Bratoft. As steward of Gunby Hall, Andrew was able to show us the development over the centuries, right up to the time it was handed over to the National Trust in 1944. This was prompted by the threat that is was to be demolished to make way for a runway extension, but once in the hands of The NT it could not be touched. He brought us right up to date with details of the hall now and events which take place there. A fascinating history of the nearest NT property to Grimsby. Our guest speaker for April was the broadcaster, writer and adventurer, Nicholas Crane, he of the rucksack and umbrella, on his programme Coast. The topic for his talk was “The British Landscape”. A tall order, I thought, especially when he started in 4500BC! However one and a half hours later we were up to date. At each stage of our islands’ evolution Nicholas was able to explain what caused the change, when it happened and the effect. He even mentioned the tsunami which separated us from mainland Europe. Our first Brexit and it did not take over 2 years! Nicholas was able to point to evidence which exists today of changes in our geography and aided by some excellent aerial photography he brought the whole thing to life. Nicholas was very accommodating and happily chatted to members in the interval and at the end as he signed books for members. All in all a very professional talk much enjoyed and appreciated by members. 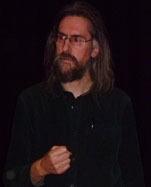 Lincoln poet and historian Nic Lance, was our guest speaker for the March meeting when he informed and entertained us with his talk about the life of Alfred Lord Tennyson. Nic brought it to life with his knowledgeable and easy going presentation style supported by some fine illustrations as we traced Alfred’s life from humble beginnings in The Lincolnshire Wolds through to “making it big” and becoming Queen Victoria’s poet laureate whilst living in the Isle of Wight. We heard about his dislike of school, being bullied and then leaving to become taught at home. Also, his love of long walks in the countryside, and along the coast round Mablethorpe. His relationships with his brother’s and other friends and finding his way to studying at Cambridge, after which he set out with a friend to travel through France to support the Spanish rebels, where he had a lucky escape and made it back to England. Nic told us of some of the loves of his life, but that for many years he was a penniless poet travelling around staying with whoever could provide him with a bed for the night. His breakthrough came when he wrote “In memorium” which became “a hit” in the upper circles and he rose to prominence once the Queen had taken an interest. On the Isle of Wight he had a family and a comfortable life with the trappings of success. Lincolnshire lad made good. Members thoroughly enjoyed the evening. You may well have been to Saltaire near Bradford, but I bet you cannot possibly know as much about it or indeed Titus Salt himself, as Maria Glot. Maria was our very special guest speaker at our February meeting. She said she could talk about this subject for 3 hours and having listened to her entertaining talk for an hour and a half no one would disagree. Maria is not just a speaker, she is an entertainer, full of facts and details about the life and times of Titus Salt and how Saltaire came to be built and what life was like there in the mid 19th century. Maria has researched some 3000 people who lived and worked there over many years. Using this information, she has produced bookmarks which include details of one of the residents or workers. Her anecdotes delivered without notes impressed our members who will regard this meeting as a memorable one. Now you see it now you don't, the art of illusion turned out to be a great evening of examples of art which deceives the eye,brilliantly illustrated by Bertie's Surrealist art. Works by Rene Magrit, Salvador Dali right up to works by the graffiti artist Banksy and many more together with images which completely baffle the brain. Examples of Trompe L'oeil used in interior deign to fool visitors. Some great vistas which turned out to be scenes painted onto walls. Bertie was knowledgeable and entertaining, including performing several magic tricks before our very eyes! Click here to see the archived News for 2016 to 2017. Click here to see the archived News for 2015 to 2016.